By offering WiFi, events, green space, and even urban housing, malls need to make themselves relevant to consumers' lifestyles. Wireless internet is fundamental for malls, Cordero says, but there is an abundance of technology that goes beyond that basic service to help consumers, including technology that helps consumers navigate and move easily around malls, and get coupons, advertisements, and maps. Malls also need to host events and have expanded their marketing departments to do just that, Gunning says. Westfield Corp. hired a Broadway producer to schedule events to give people more reasons to come to its malls, he says, adding that the event could be an art show, wine tasting, or traveling art exhibit. That has led to designs for larger space where those kinds of events can happen inside and outside, he says. The key word for today’s malls is relevance to people’s lives and lifestyles, says Brian Andrus, president of the Florida Gulfcoast Commercial Association of Realtors. People want social interaction, whether it’s having a cup of coffee with friends or events such as dance contests or craft shows, Andrus says. An analysis of what kind of experiences consumers want and how best to deliver them is required so that, however the space is renovated, there’s a market that will support it, Maloney says. That may mean tearing down the entire structure or it may mean downsizing to 200,000 square feet from 600,000, he says. It could mean adding condos or apartments to give a city more multifamily housing, Maloney says. The result could also be a hotel, school, grocery store, or office space. Including housing in the area around a mall and in a mall that has been renovated for mixed-space use can help address the shortage of urban housing, Dixon says. Including food and entertainment in the mall makes it more attractive for individuals and families because they have options within easy walking distance. Malls in the suburbs are turning into walkable districts – mini downtowns — because of these transformations, Dixon says. 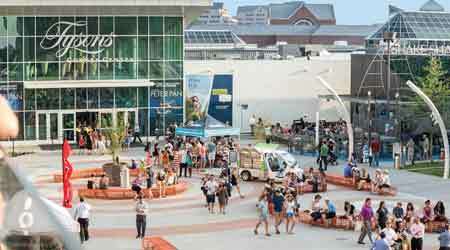 Changes to malls can have a ripple effect on the surrounding community. A renovation of the nearly 800,000-square-foot Tanglewood Mall near downtown Roanoke, Va., will shift the mix more toward food and less toward retail, particularly mass market retail, Dixon says. More than half the mall will be demolished but pieces of it will remain, and a main street and cinema will be added. The changes are leading to multi-family housing being built around it because it’s an attractive place to walk to, Dixon says. Although there aren’t changes being made to the Dayton Mall in Ohio anytime soon, Dixon says the 1,000 acres around it are quickly changing. A main street is taking shape, one that will have four to five stories of housing on top of food and entertainment venues. And as the main street becomes more valuable than the strip retail next to it, the strip retail will be developed and grow with the main street, Dixon says. Desiree J. Hanford, a contributing editor for Building Operating Management, is a freelance writer who spent 10 years as a reporter for Dow Jones. She is a former assistant editor of Building Operating Management.